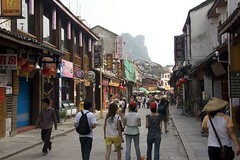 Here is a simple context photo from Yangshuo. You can see a bit of the hills in the background that make it so beautiful. This is a true blue back backing place with multiple wood fired pizza restaurants where you can even get blue cheese! The main problem and why we wanted to get out so quickly is the heat and the humidity. The days were definitely ‘3 shirt days’ (a description from a book that B is reading describing how it’s so hot you have to change your shirt 3 times). We spent our time eating, having massages, drink cold beer, trying to find the best air conditioning, and sweating (well B glowed I sweated). Bianca drunk on one beer again!